My apologies for not posting earlier, but I am sure that you would understand if you saw my little life right now.. I'm trying to juggle having a baby and getting back to work.. And let me tell you that it's not easy at all! When I'm with the baby the phone rings off the hook for work, and when I'm away from Phares I feel super guilty that I'm not there so I try to get back as soon as possible. I know it may be a little early to get back to work already, but to be honest, I needed to do that for several reasons. First of all when you own your own business, it's not like you can just take a maternity leave and not really care about what's going on at work (that's the not so rosy side of being your own boss), because the bakeries are somehow my little babies too, and I need to be on top of things as much as possible. Now even though I have a fabulous team at Kitsch Cupcakes I still feel like I can't leave the place for too long :) Another reason for getting back to work was that I'm not really familiar with being home so much.. I used to have such a hectic routine and going from being super busy to being at home all the time was a huge change for me.. So now I'm trying to juggle both, working and being a new mommy.. I don't leave my little angel for too long, and that's when running your own business and being able to manage your own time is just lovely! So today is a quite personal post, like I've mentioned many times, this blog has become my little journal, and somehow writing about what I go through makes me realize things.. But since this a food blog after all, I'm going to end this post with a recipe :) I just finished a photo shoot at home, and it's almost time to feed my little munchkin so I will post my Baked Asparagus recipe which was featured in Harper's Bazaar Arabia in the September issue. It's a simple yet delicious dish, which can be munched on as a starter or side dish.. Hope you enjoy it! Preheat oven to 200C. 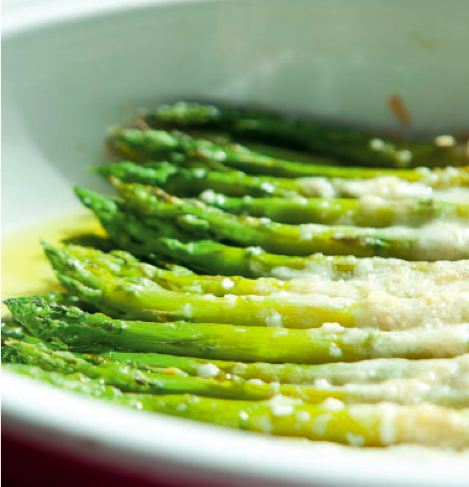 In a pan, heat a knob of butter and sauté the asparagus for a few minutes, just until slightly tender. Place them in a baking dish, sprinkle with Parmesan, season and bake for about 10 – 15 minutes until the parmesan crisps up a little. Serve immediately. Good luck with everything...I guess it definitely is a hard decision to make for new Moms but it's important to also do what's best for you as well. PS - Murrindie's last name is "Frew" (we work in the same company which is why I know).